Chanteur Anglais né Ronald Wickerly, le 17 Avril 1941 à Liverpool (Angleterre). Billy Fury fait sa première apparition en 1958 à Birkenhead où il est remarqué par le producteur Larry Parnes. De 1959 à 1966, Billy devient le chanteur le plus célèbre d'Angleterre avec Cliff Richard. Rocker au jeu de scène suggestif et aux cheveux gominés, il était alors une copie d'Elvis Presley. 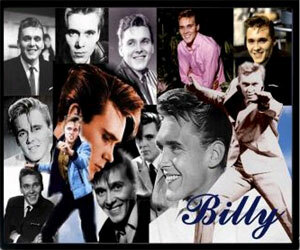 Billy Fury est décédé à la suite d'une longue maladie le 29 Janvier 1983. In the early days of British rock & roll, there were dozens of contenders for stardom: Tommy Steele, Cliff Richard, and Marty Wilde were among the players who rose to the challenge for at least a few years. 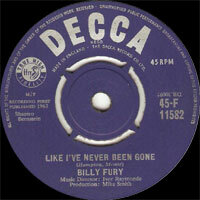 Billy Fury, by contrast, was the real article from day one, and never really surrendered the title. He was also the most prodigiously talented of his generation of British rock 'n roll singers, a songwriter of considerable ability, and a decent actor as well. He was born Ronald Wycherley, in Liverpool. A sickly child, he experienced his first bout of rheumatic fever at age six, the beginning of chronic health problems that would take his life before age 45. At 11, he started music lessons, taking up the piano, and he got his first guitar at age 14. By 1955, the skiffle boom had begun in England and Wycherley was leading his own local group, while earning money working on a tugboat and then as a stevedore. By 1958, Wycherley was playing locally and had won a talent competition, and was writing his own songs. Wycherley was discovered by impressario Larry Parnes on October 1, 1958, in a story that quickly assumed the status of legend among the British youth of the period. He attended a performance of The Larry Parnes Extravaganza, on which one of the featured performers was Marty Wilde, a hot young rock 'n roll star who was already well known from his appearances on the television series Oh Boy! Wycherley got backstage to offer his own songs to Wilde in the hope that he might perform them -- instead, he was seen and heard by Parnes and booked into the show that night. The applause that Wycherley received earned him a permanent spot on the tour and Parnes as his agent. 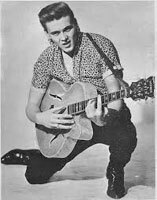 In keeping with Larry Parnes' established proceedure of giving his singers stage names derived from distinctive emotions and attributes -Marty Wilde, Johnny Gentle, Vince Eager -- Ronald Wycherley became Billy Fury. His early performances were so suggestive by English standards that he was forced to restrain himself from his more overtly sexual stage moves when a curtain was brought down on one of his shows. 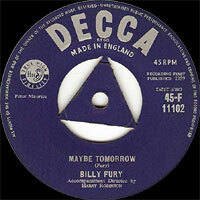 Billy Fury's recording career began early in 1959 with "Maybe Tomorrow," a song that he wrote himself and which charted soon after its release. He made his television debut soon after, in a televised play called "Strictly For Sparrows," and he was soon a fixture on musical showcases such as Oh Boy! He revealed himself a talented singer, and perhaps the closest that England came to producing its own Elvis Presley, capable of dark, brooding, intensely sexual performances such as "Baby How I Cried" (another original) but also of turning in gentle, vulnerable ballads. His mix of rough-hewn good looks and unassuming masculinity, coupled with an underlying vulnerability, all presented with a good voice and some serious musical talent, helped turn Fury into a major rock 'n roll star in short order. He was one of the very few English rock 'n rollers of the period who could (and did, on stage and on television) stand alongside the likes of Eddie Cochran and Gene Vincent with no apology or excuse for being there, and Cochran intended to arrange an American tour for Fury, which never came about because of the car crash that took Cochran's life at the end of that British tour. 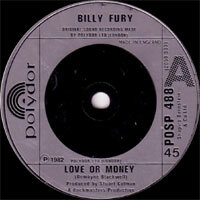 After a string of hit singles, Fury cut his debut album, The Sound of Fury, in early 1960. Released in April of that year, The Sound of Fury was the best rock 'n roll long-player (albeit only a 10-inch platter) ever to come out of England up to that time. Fury was singing in a killer rockabilly type voice and was backed by some of England's best rock 'n roll musicians, including guitarist Joe Brown, one of the few serious rockabilly players in England, and drummer Andy White, who later played on the original release version of the Beatles debut single "Love Me Do." The album sold well and has been re-released a half-dozen times since, including a CD version in the early 1990's, and among its strongest adherents is Keith Richards, who, in a 1970's interview, declared The Sound of Fury one of the greatest rock 'n roll albums of its era and one he swore by. 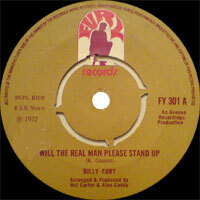 Fury's early 1960's recordings took on a more sophisticated air as, in keeping with the trends of the times, he moved toward more of a pop-rock sound, similar to Elvis Presley's film material. He was still a strong singer, however, and never had to fall back on the lure of novelty tunes or romantic pop to sell records. What's more, on stage had a very compelling and popular act, backed variously by the Beat Boys and then the Blue Flames (who eventually got a keyboard player turned singer named Georgie Fame in their their line-up, and became his band). The Beatles even tried (and failed) an audition to back Fury on a tour during this period. 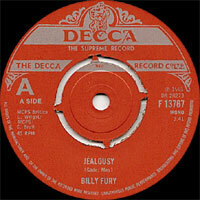 In 1960, Decca Records made a decision to soften Fury's sound, at least on his singles. "Talkin' In My Sleep" and "Don't Worry" backed by the Four Kestrels were two results of this change, but they still come off as decent rock 'n roll. It was the orchestrated "Halfway To Paradise" in 1961 that began his brief assault of the top of the charts, hitting No. 3, and followed a few months later by the No. 2 charting "Jealousy," and the No. 5 charting "I'd Never Find Another You." One of his self-penned B-sides of this era, "Fury's Tune," however, was an even better representation of Fury at his most intense and charismatic, a dark, brooding, fiercely seductive performance that was a match for the best work of Elvis Presley. By 1962, Fury was the top rock 'n roll attraction in England, backed by the best band of the era -- the legendary Tornados, of "Telstar" fame -and appearing on television regularly, and even giving a real acting performance in the feature film Play It Cool. He also ventured to America, making little impact (as was the case with virtually every English rock 'n roller) but getting to meet Elvis Presley on the set of the film Girls Girls Girls. In 1963, Fury was in a seeming unassailable position. By the time, his one-time rivals Cliff Richard and his backing group the Shadows had shifted their focus to a much softer, more romantic brand of rock 'n roll, leaving Fury was the only harder rocking music idol of the era. His records sold well enough to justify the release of two full LPs including the live recording We Want Billy. He also got a new, seemingly permanent backing band in the guise of the Gamblers, who provided him with the support he needed to make his records and concerts among the best of the period. Only the arrival of his fellow Liverpudlians The Beatles on the top of the charts ended Fury's dominance of the teen music scene in England. They weren't that different as personalities -- a look at Fury's performance in the movie Play It Cool will even bring to mind images of Ringo Starr, who grew up in the same part of Liverpool -- except that The Beatles were more guileless and less calculated in the way they presented themselves, and they played a harder, different brand of music, less focused on pop and more on American r&b of the period. 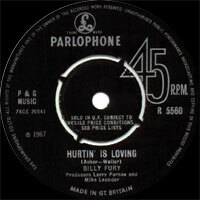 Fury continued to chart records into 1964, and was considered hip and viable enough to justify appearances on programs like Ready! Steady! Go! In the summer of that year, he starred in a semi-autobiographical movie, I've Got A Horse, and he got a television show of his own late that year. He continued to get good reviews for an exciting show into 1965, but by then the handwriting was on the wall -- his records seldom charted better than the mid-20's or lower. Additionally, Fury's health began to deteriorate, which took him off the road, where he was at his best. In 1966, he left Decca Records and signed a five-year contract with EMI's Parlophone Records, during which he would see some very modest success but nothing like the frenzied stardom of his first seven years in music. 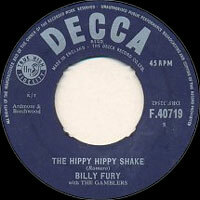 Fury underwent heart surgery in 1970 and another in 1971, and resumed performing the following year. By the mid-1970's, there was a rock 'n roll revival going on in England that saw the re-release of The Sound of Fury LP and other parts of his catalog, and he toured England successfully with his one-time idol Marty Wilde. 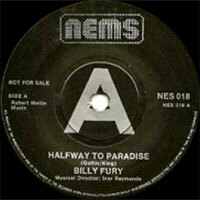 When he wasn't performing, Fury looked after his other interests, which included wildlife preservation. A 1976 heart operation brought an end to Fury's musical career, except for occasional recording and television appearances. 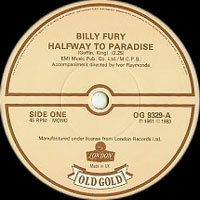 In 1978, Fury re-recorded his classic songs for K-Tel, and in the early 1980's recut his old hits yet again for Polydor (which, by that time, owned Decca Records). 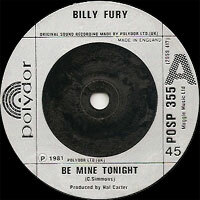 A single, "Be Mine Tonight," just missed the British charts in 1981. On March 4 of the following year, Fury collapsed and nearly died while working on his farm. He went back on tour that summer and managed to place the singles "Love Or Money" and "Devil Or Angel" on the English charts that same season. Plans for a new album and a national tour were made, but on January 27, 1983, he was found unconscious in his home, and he died that same day in hospital. Amid numerous tributes and memorials, a posthumous single, "Forget Him," charted in England later that year. Billy Fury remains perhaps the most fondly remembered of England's early rock 'n roll stars. In contrast to Cliff Richard, he never changed his sound, and he also -- despite a satrong dedication to animal rights and conservation -- never mixed his personal beliefs and his music in a public way. 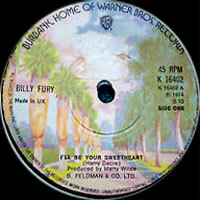 Numerous reissues and releases of previously unreleased material by Fury have continued to appear in the compact disc era, most recently the 40th Anniversary Anthology double CD set and Beat Goes On's two-on-one CD of We Want Billy and Billy. 10/1965 SP DECCA F 12230 (UK) . Run To My Lovin' Arms / Where Do You Run ? 1984 LP 12" MAGNUM FORCE MFLP 1027 (UK) LOVING YOU - Sheila / Maybe Baby / Lazy Life / I'm Gonna Love You Too / In My Room / All The Way To The USA / Loving You / Your Words / Suzanne In The Mirror / Well Alright / I Love You / Lyanna.